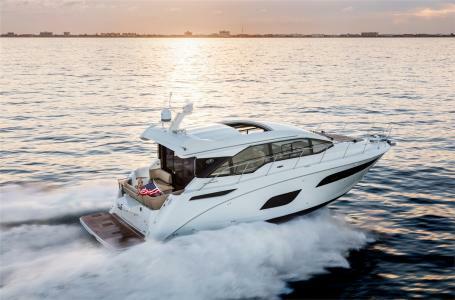 2017 Sea Ray Sundancer 460 The Sundancer 460 embodies all the celebrated qualities of Sea Ray's iconic Sundancer line. Its open floorplan and thoughtful amenities contribute to an overall sense of ease and flow, at once inviting and invigorating. 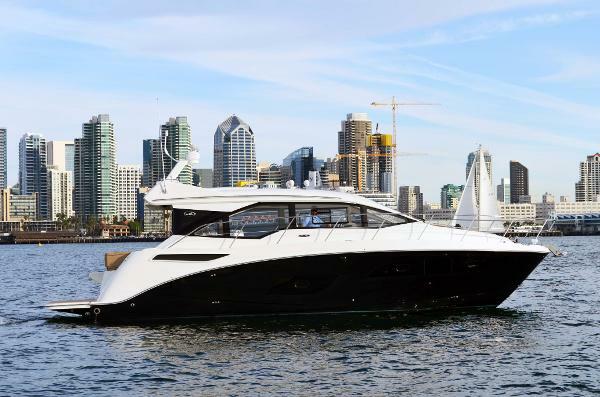 Generous, interconnected social zones make the Sundancer 460 perfect for gathering with friends, while high-end finishes and a sleek, elegant profile instill pride. 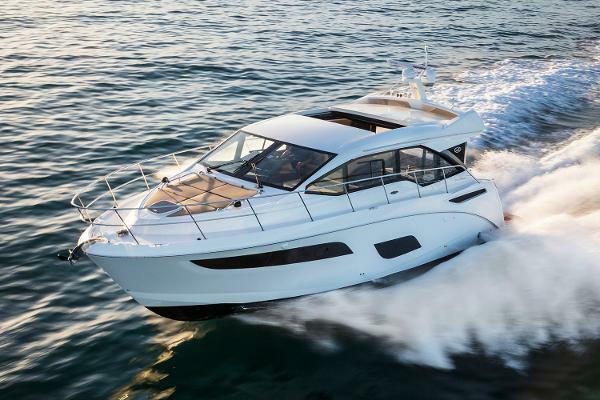 In terms of performance, count on the standard Axius® or optional Zeus® propulsion system to ensure confident command for the captain and luxury cruising for all. 2017 Sea Ray Sundancer 460 Here is your opportunity to save a ton of money, don't miss it!! 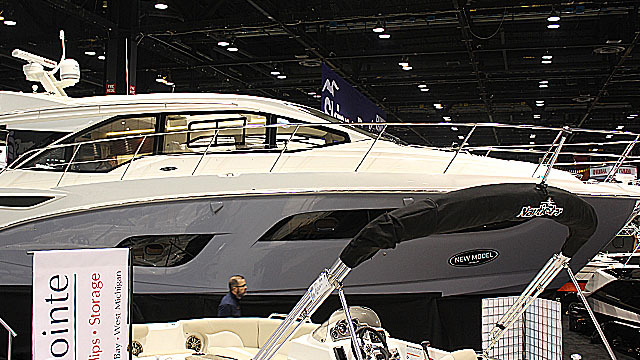 If you are considering Sea Ray's 460 Sundancer, this boat is a must see! With less than 100 hours, "New" condition, full warranty, all the right options, and far under the cost of new. 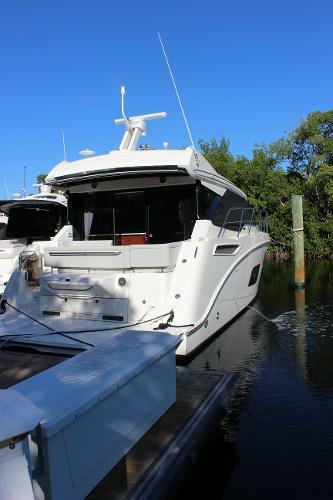 This 2017 46 Sea Ray is a no brainer, it won't last long, call today!! Actual pictures coming soon... "Like New" 2017 Sea Ray 460 Sundancer With Twin 526 HP Zeus QSB 550 Cummins With Joystick Control This Like New, Low Hours 460 Sundancer embodies all the celebrated qualities of Sea Ray's iconic Sundancer line. Its open floor plan and thoughtful amenities contribute to an overall sense of ease and flow, at once inviting and invigorating. 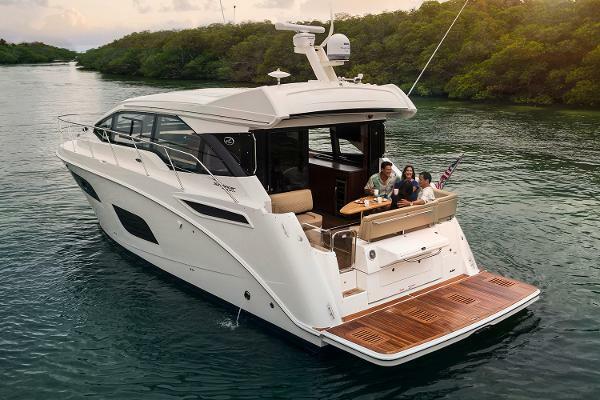 Generous, interconnected social zones make the Sundancer 460 perfect for gathering with friends, while high-end finishes and a sleek, elegant profile instill pride. 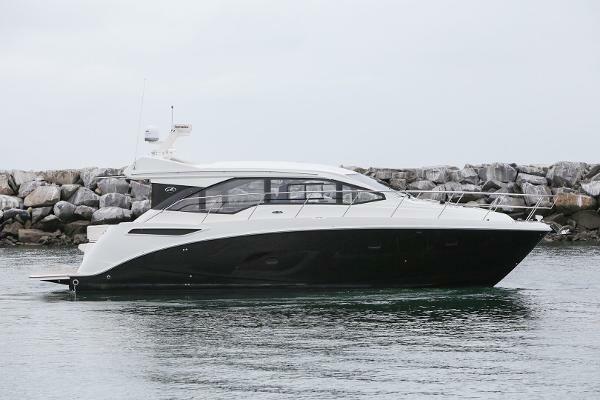 In terms of performance, count on the standard Zeus® propulsion system to ensure confident command for the captain and luxury cruising for all. Features Include, Full Beam Master Stateroom With Enclosed Head And Stall Shower, Forward Private Stateroom With Enclosed Head And Stall Shower, Dark Cherry Interior Wood, White Hull Color, Underwater Lighting Package, Cockpit Sea Grass Exterior Carpet, Sun Room Sliding Glass Door, Electric Sunroof With Shade, Upper and Lower Cabin Air Conditioning With Heat, 13.5 KW Generator, Washer / Dryer Combo Unit, Central Vacuum System, Stateroom, Sun Room And Salon TV / DVD Package, Salon / Cockpit Stereo System, Cockpit Sun Electric Awning, Cockpit Galley With Grill, LED Courtesey Lighting Package, Raymarine Chart Plotter, GPS, Open Array Radar, Depth Finder, VHF Radio, Remote Spotlight, Windlass With Anchor Package, Engine Oil Change System, Wine Cooler, Safe, Refrigerator / Freezer, Electric Cook Top, Microwave Oven, Electric Vacu Flush Heads, Battery Charger, Glendinning Shore Power System, Carbon Monoxide Detector, Automatic Fire Suppression System, Bilge Pump With Alarm, Trim Tabs, Bottom Paint, Trades Welcome..
2017 Sea Ray Sport Sundancer 460 2017 Sea Ray 460 Dancer, Black hull, Black canvas, T Zeus QSB 550 Diesels, Colored hull, 120/240 VAC/60 cycle electrical system, Light engineered stone upgrade, French walnut wood blind upgrade, Cockpit infinity snap in flooring, Hydraulic swim platform teak flooring, Cockpit w/entry steps teak flooring, Portlights opening in every stateroom, Salon sofa with pull out bed, Ice maker, Wine cooler, Washer/Dryer, Interior carpet runners, Interior stereo upgrade, Double bed mattress topper - fwd stateroom, TV F.S. with RMT blueray - forward stateroom, DSS Satellite TV system, Inverter - 120v/60 cycle, Macerator with seacock interlock system, Sunshade, Foredeck, Audio system, Foredeck, Windshield w/opening side windows port & starboard, Canvas, mesh windshield shades, Awning, electrical retractable over cockpit, Exterior stereo upgrade - cockpit, Transom gourmet space w/grill, Exterior lighting package, Hydraulic swim platform, Lighting, underwater - transom, Flag pole & base, U.S. flag, Raymarine ES128 chartplotter/aux display, Radar, open array, Raymarine fish finder for Es 128 display, Fuel transfer pump - diesel only, Extended range fuel tanks, Windlass, all chain w/galv anchor, Anchor, stainless steel, Oil changer system. 2017 Sea Ray Sport Sundancer 460 2017 Sea Ray 460 Dancer, Black hull, Black canvas, T Zeus QSB 550 Diesels, Colored hull, 120/240 VAC/60 cycle electrical system, Wood blind upgrade, French walnut, Softgoods sy blue/silver, Dark tone etx - earth mat/beige uph, Teak flooring, hydraulic swim platform, Teak flooring - cockpit w/entry steps, Portlights, opening in every stateroom, Table - high/low - salon, Safe, Wine cooler, Washer/Dryer, Interior carpet runners, Interior stereo upgrade, Double bed mattress topper - fwd stateroom, TV F.S. w/RMT blueray - forward stateroom, Inverter - 120v/60 cycle, Macerator with seacock interlock system, Sunshade, Foredeck, Audio system, Foredeck, Windshield w/opening side windows port & stbd, Canvas, mesh windshield shades, Awning, electrical retractable over cockpit, Exterior stereo upgrade - cockpit, Transom gourmet space w/grill, Exterior lighting package, Hydraulic swim platform, Lighting, underwater - transom, Flag pole & base, U.S. flag, Raymarine ES128 chartplotter/aux display, Radar, open array, Raymarine fish finder for Es 128 display, Fuel transfer pump - diesel only, Extended range fuel tanks, Windlass, all chain w/galv anchor, Anchor, stainless steel, Oil changer system.